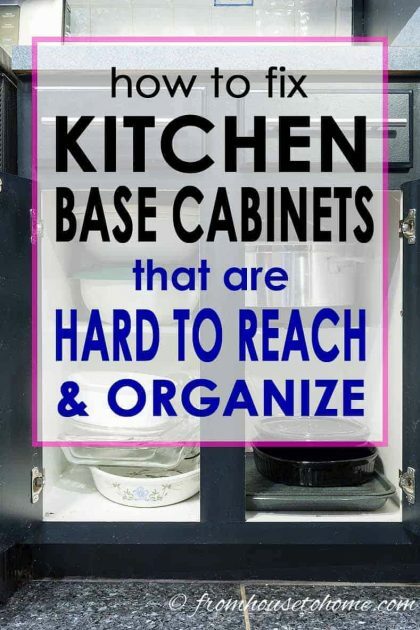 Have a kitchen base cabinet with shelves that are disorganized and hard to reach? Make it work with these step-by-step instructions on how to convert shelves to drawers. Recently, I have been on a quest to get organized…and I have now moved on to the kitchen which can really use some help! I never seem to have enough room to store all of my kitchen gear and dishes. So everything is stacked up. It seems like I always have to move a bunch of things out of the way every time I want to get something out of the cupboard. 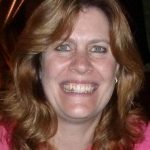 I know that I am not the only one with this problem…so hopefully some of the solutions that work for me will work for you also! Part of the problem is that my kitchen cabinets don’t have any organizers. And the other (related) issue is that the cabinets have a lot of wasted space. Here’s the whole list of what I came up with…and I have to say my kitchen is much more organized now that I have implemented all of these changes!! 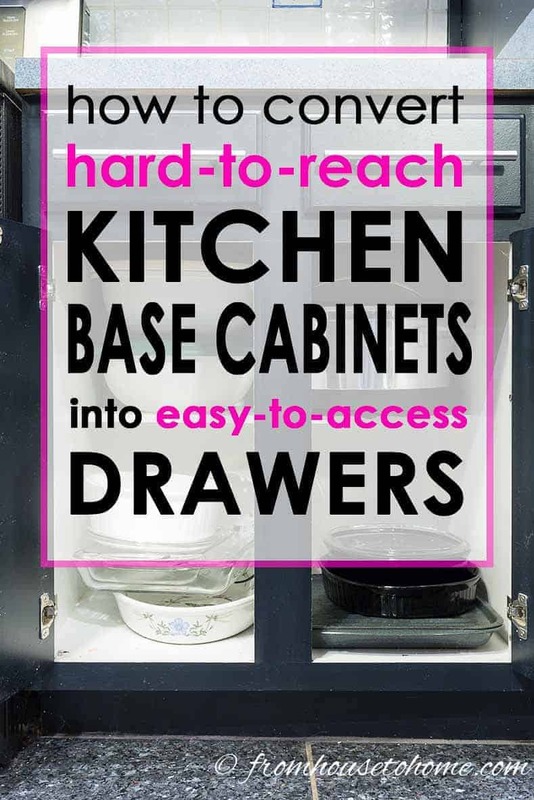 Turn hard-to-reach shelves in the base cabinets into easy-to-access drawers (that’s this week’s challenge). 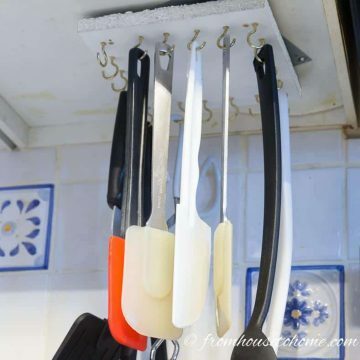 Clear drawer clutter (part 1) by moving cooking utensils to a hanging storage rack. 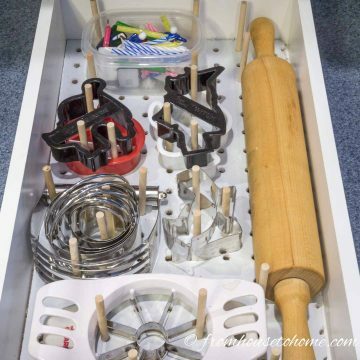 Clear drawer clutter (part 2) by organizing the rest of the utensils that end up in a drawer. 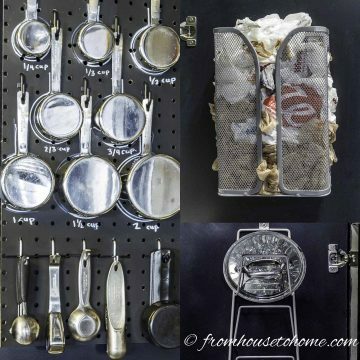 Clear the countertops (part 1) by moving spice racks to a magnetic spice wall. But back to the task at hand. Keep reading to learn how to convert shelves to drawers…and make better use of all of that base cabinet storage space. The original cabinet was a standard set of drawers with a shelf inside. The shelf was not move-able and was only half the depth of the cabinet, which left a whole bunch of wasted space. I had originally thought that I would put in a new shelf that extended all the way out to the cabinet doors, but quickly realized getting things in and out of the back of those shelves would be impossible (okay…slight exaggeration…not impossible, but not very easy). So then I thought I would buy some of those pull-out drawers that fit inside the cabinets. Until I realized that because my cabinets are face-framed, the space between the cabinet edge and the middle framing piece was only 10½”. Even if I could find pull out drawers that were that narrow, what can you fit in a 9″ drawer? Add the cost of the ready-made pull-outs and I gave up on that idea. Then I had a brain-wave! Why not convert those shelves into drawers? 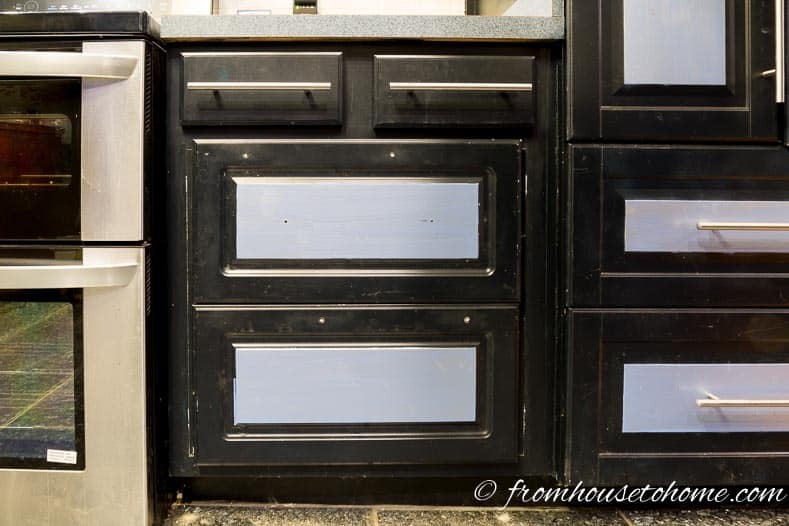 Because this cabinet is 24″ wide, the opening in the cabinet is almost square, which means the doors could be turned sideways to become drawer fronts…and I could have proper pull out drawers like the large cabinet right next to it. 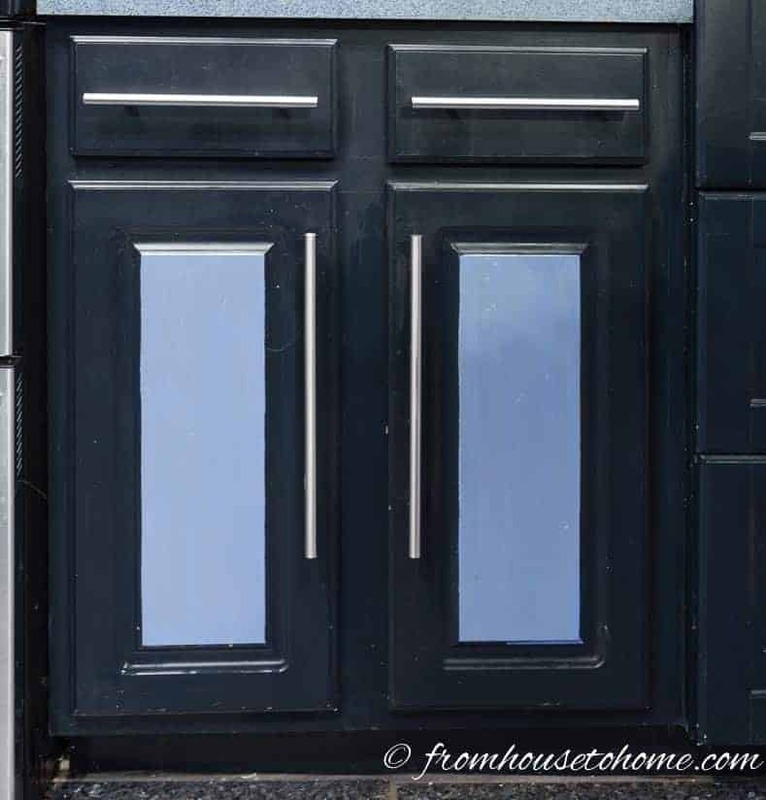 Note: Re-using the same door fronts will only work if your cabinet width is about the same as your door height. Otherwise, you will have to buy new drawer fronts that are the correct width. But the rest of the project will still work! Since I already have some base cabinet drawers, I already know I’m going to love them! 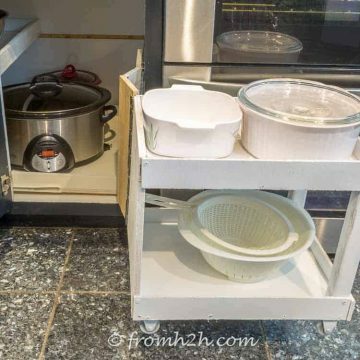 They are great for storing pots and pans, containers, mixing bowls, dishes or pretty much anything else that you would normally store in your bottom cabinets. And the drawers make getting at those items really easy! Keep reading to find out the step-by-step instructions to convert shelves into drawers. 1. 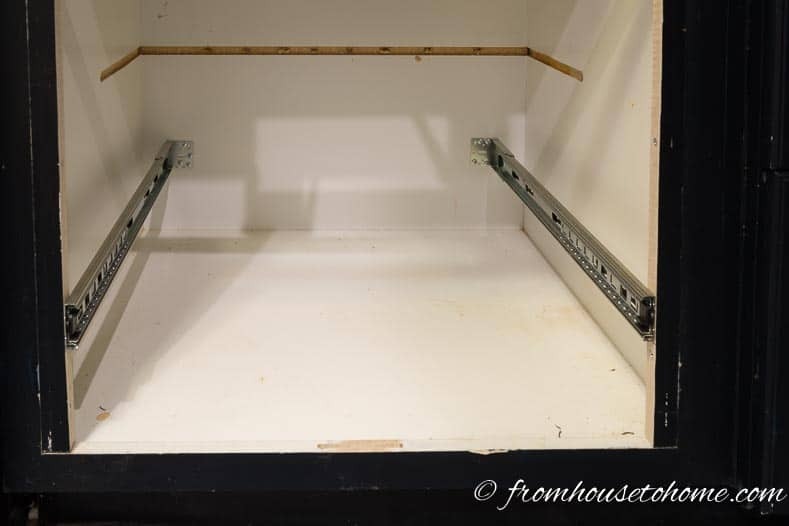 The first step in the process of converting shelves to drawers is to remove the doors from the kitchen cabinet. 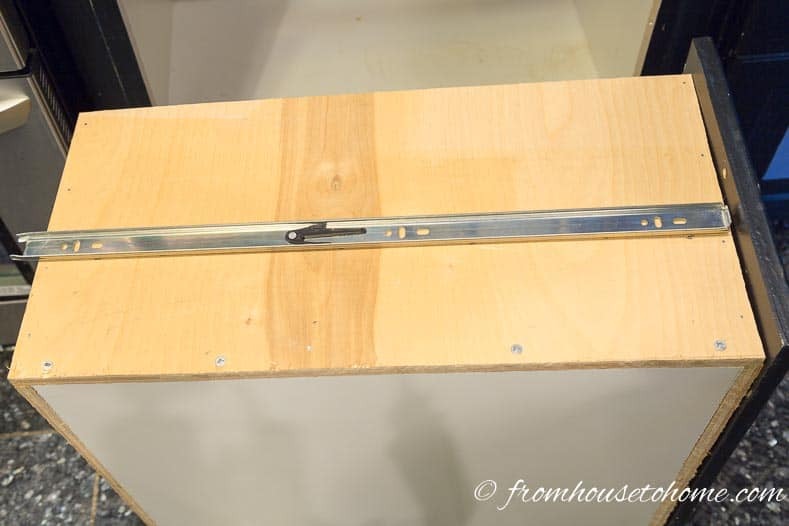 This is fairly easy…just undo the screws that are holding the hinges onto the frame. 2. Then remove the hinges from the door. Again, undoing a couple of screws and pulling the hinge hardware out of the hole in the door was all it took. 3. Remove the knobs or handles. 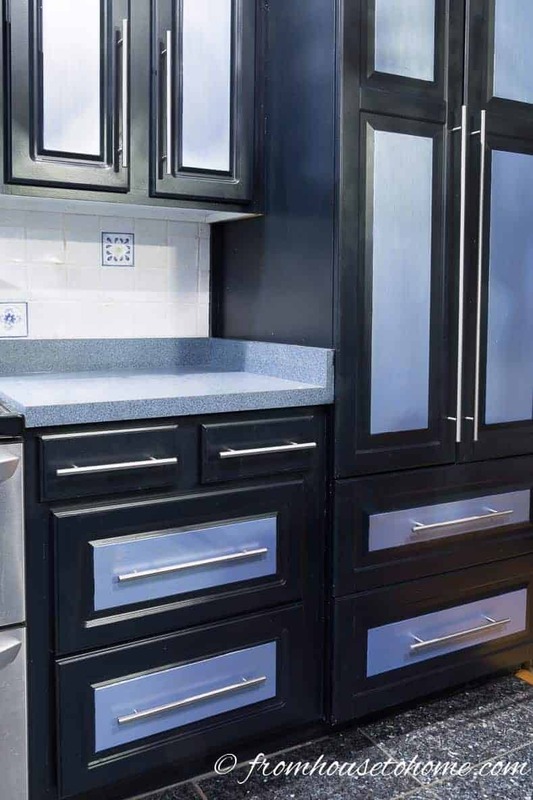 Depending on the type of hardware you have on your doors, you may need to purchase a different kind to match what is on any other drawers in your kitchen. In my case, I used the same handle style for both doors and drawers, but it is installed in a different place on the drawers (so I still had to remove them from the door). 4. Fill the holes left by the handles with wood filler. Smooth it out over the top of the hole using a scraper. You can also fill the hinge holes if you want to, but i didn’t bother. When I re-installed the front onto the drawers, I made sure that the hinge holes were on the bottom side of the drawer so that you don’t see them. This step in the process to convert shelves to drawers will only be necessary if you have face-framed cabinets like I do. 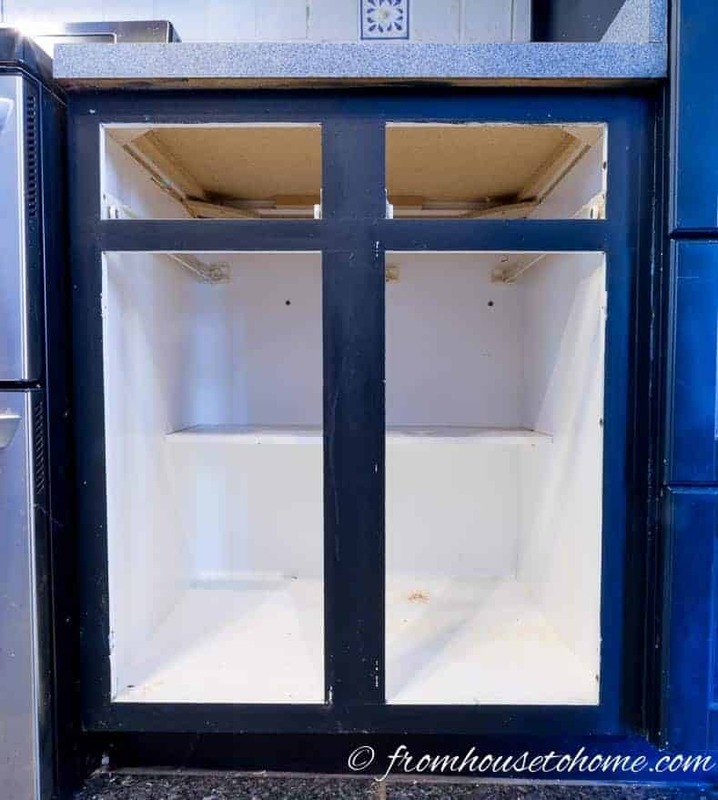 Since the hole in my cabinet was actually a little wider than the height of the doors, I wanted to be able to re-use the center frame piece to build out the cabinet frame to the correct width. So I had to find a way to cut it out without wrecking the wood (or MDF as it turned out to be). 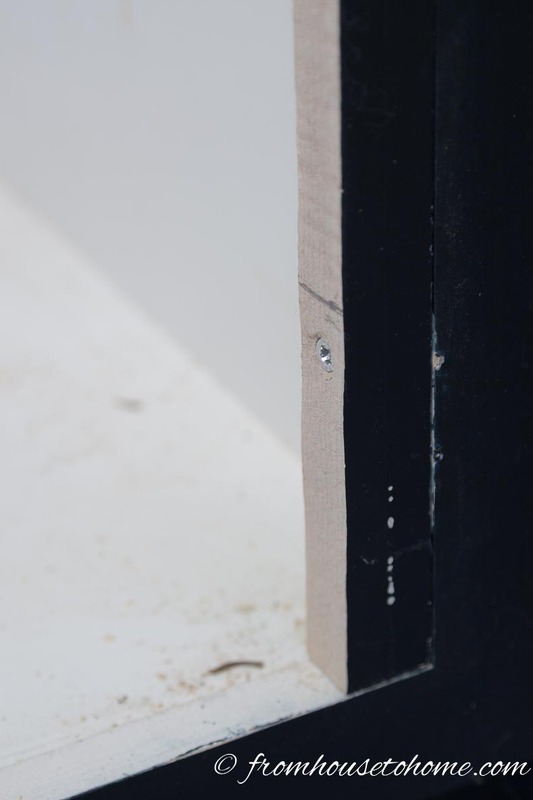 The solution was to use a jamb saw…the kind that you use if you’re re-doing a floor and need to cut out a piece of the door jamb. 1. Use a jamb saw to cut the bottom of the center frame. Make sure to keep it as level as possible so that you are only cutting the pegs that hold it in place. 2. Once the bottom is cut, you should be able to move the bottom of the frame piece out a bit and pull out the pegs holding it in place at the top. Mine was also stapled in place from inside the cabinet, so I had to remove those staples as well. 3. If the pegs are glued into the top of the center frame piece (mine were), use the circular saw to cut them off so that the frame piece is level at the end. 4. Since I wasn’t trying to save the shelf, I took a brute-force approach to getting rid of it. Use the circular saw to make cuts in the saw at either end, and then hit it with a hammer. The shelf came right out. My cabinet needed to be built out by an inch on either side so that the drawer front would overlap the frame. I re-used the center frame piece of wood for this…it was already cut to the right height and painted the right color. 1. 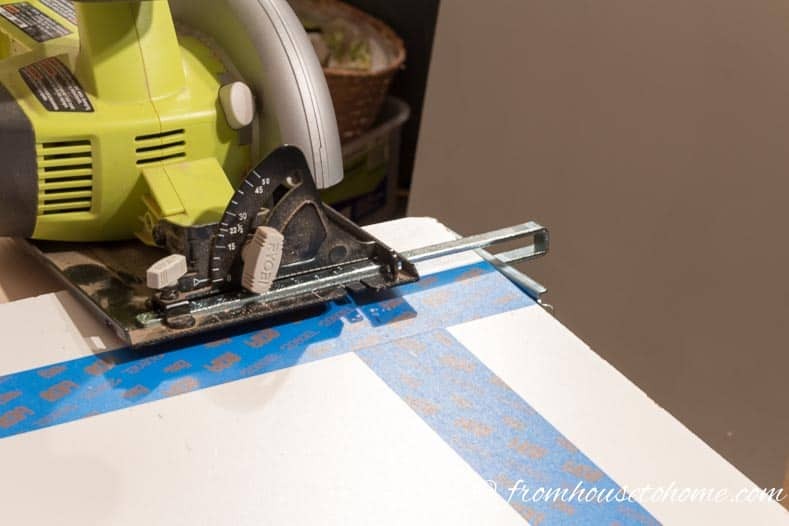 Cut the center frame into 2 strips that are each 1″ wide. 2. 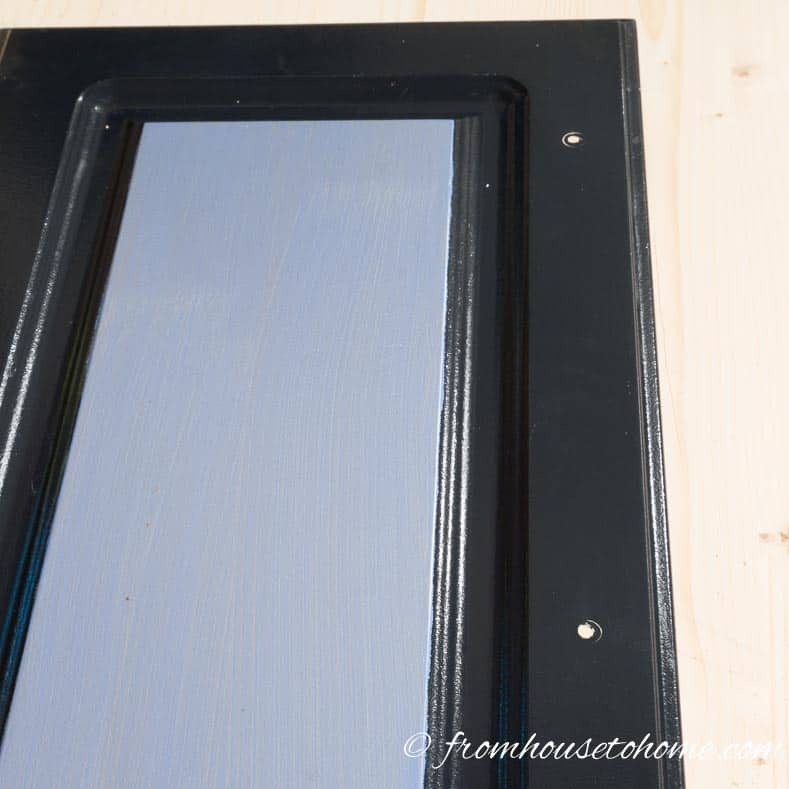 Making sure that the painted side is out, screw these 1″ strips to each side of the existing cabinet frame. 1. Figure out the size of the bottom of the drawer. 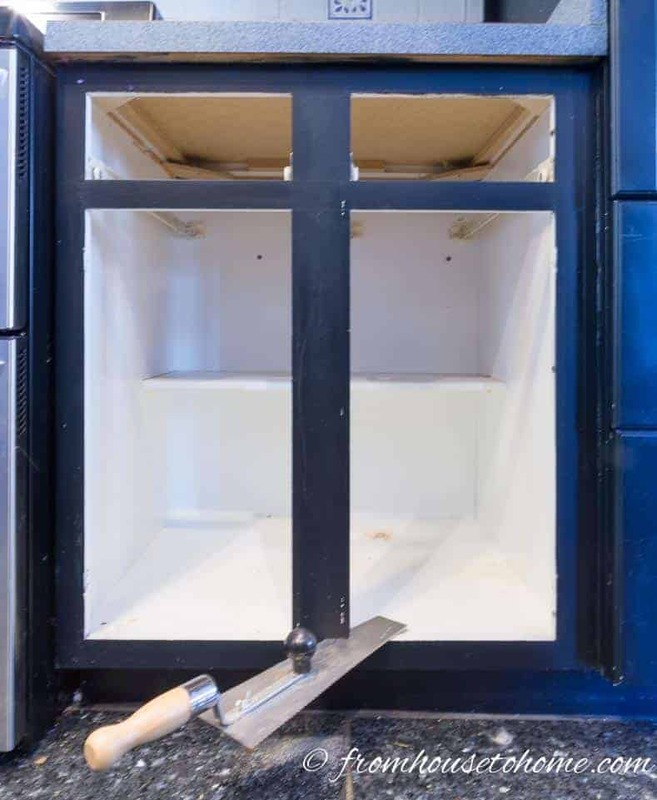 For this step, you will need to measure the width of the hole in the cabinet, and the depth of the cabinet. 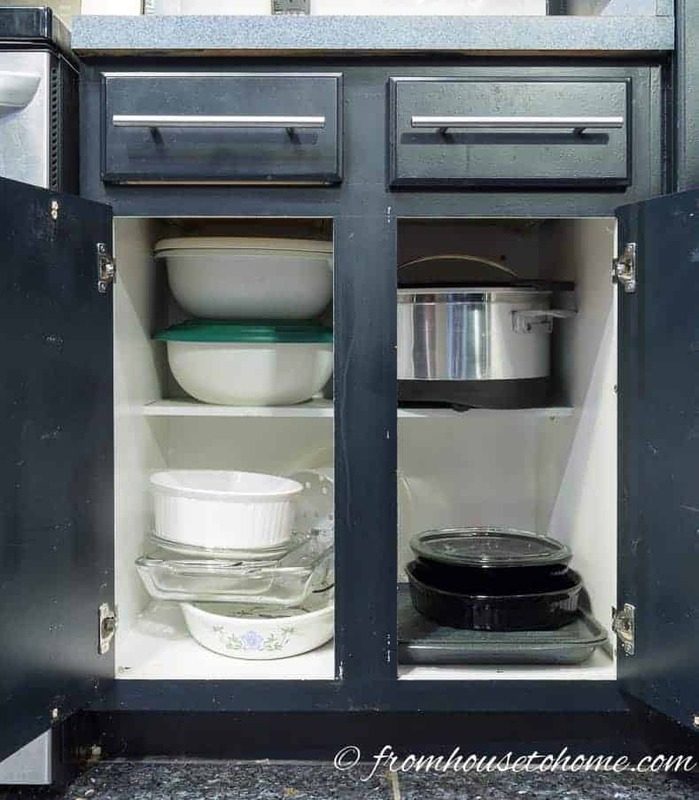 The bottom of the drawer should be 2″ shorter than the width of the hole and 2″ shorter than the depth of the cabinet (usually 22″ since standard base cabinets are 24″ deep). 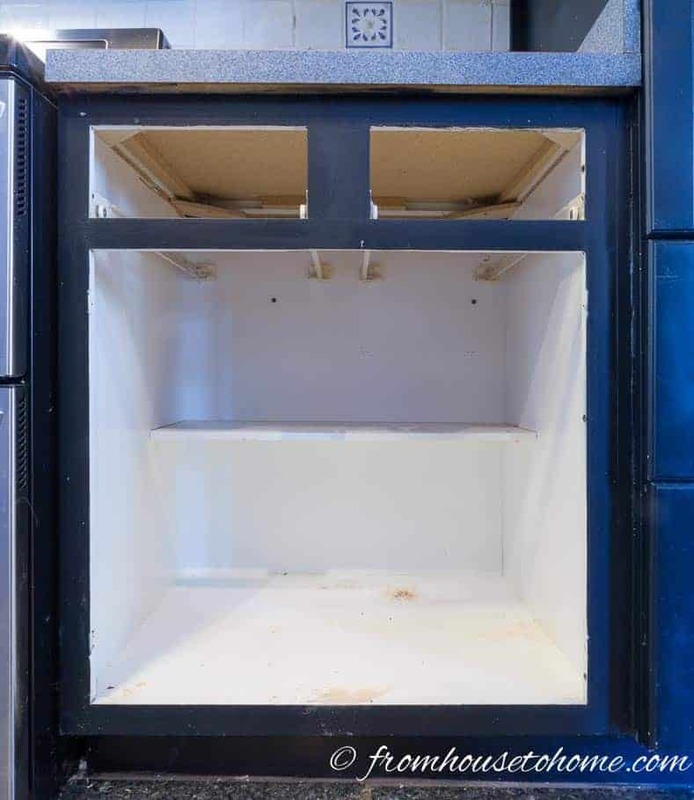 In my case, the hole in the cabinet was 22″ wide (after I installed the extra frame pieces above), and the cabinet was 24″ deep. 2. 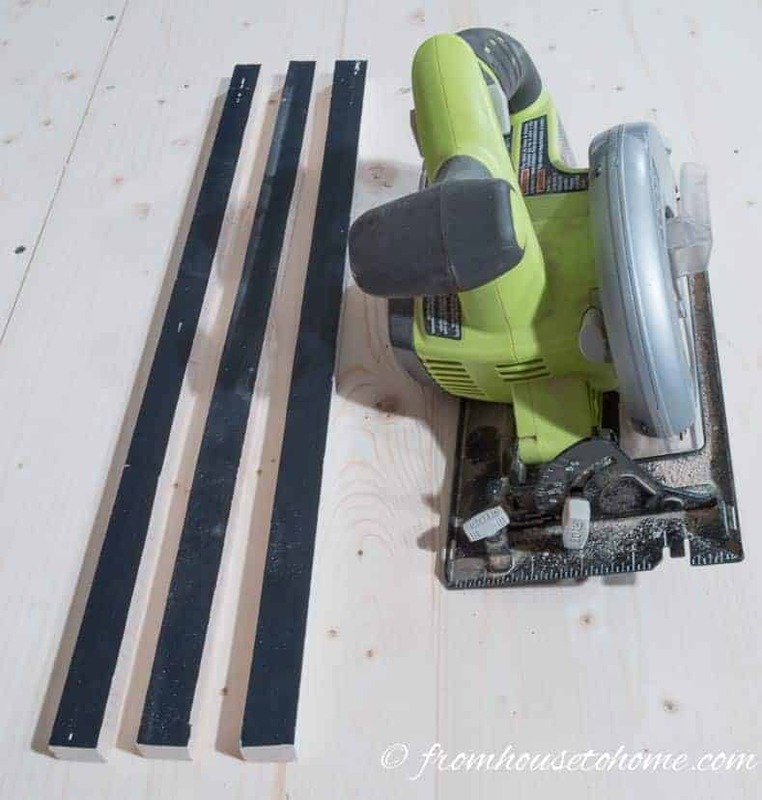 Use the circular saw to cut 2 pieces of the ¾” plywood to the size of the drawer bottom. Note: I chose to use relatively thick plywood for the bottom of the drawer because my drawer is fairly large size, and I may put some heavy fairly heavy items in it…so I didn’t want it to bow or break under the weight. Using a circular saw fence will help keep the cut straight. 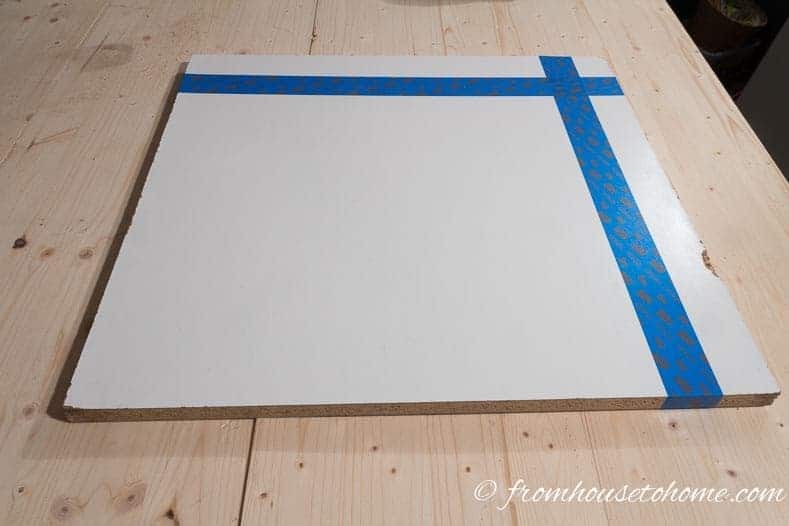 Taping the board will help keep the edge from getting chewed up by the saw. 4. Use the circular saw to cut the ends of the drawers from the ½” plywood. These will be the same length as the drawer bottom width and the same width as the drawer height. In my case, they were 20″ x 10½”. 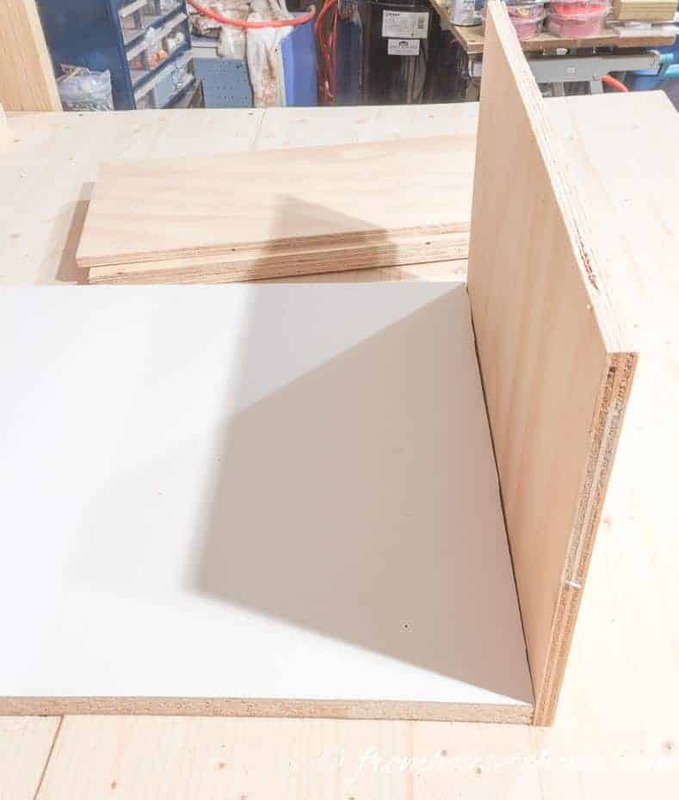 To make 2 drawers, you will need 4 of these boards. 5. Use the circular saw to cut the sides of the drawers from the ½” plywood. These will be 1″ longer than the drawer bottom depth and the same width as the drawer height. In my case, they were 23″ x 10½”. 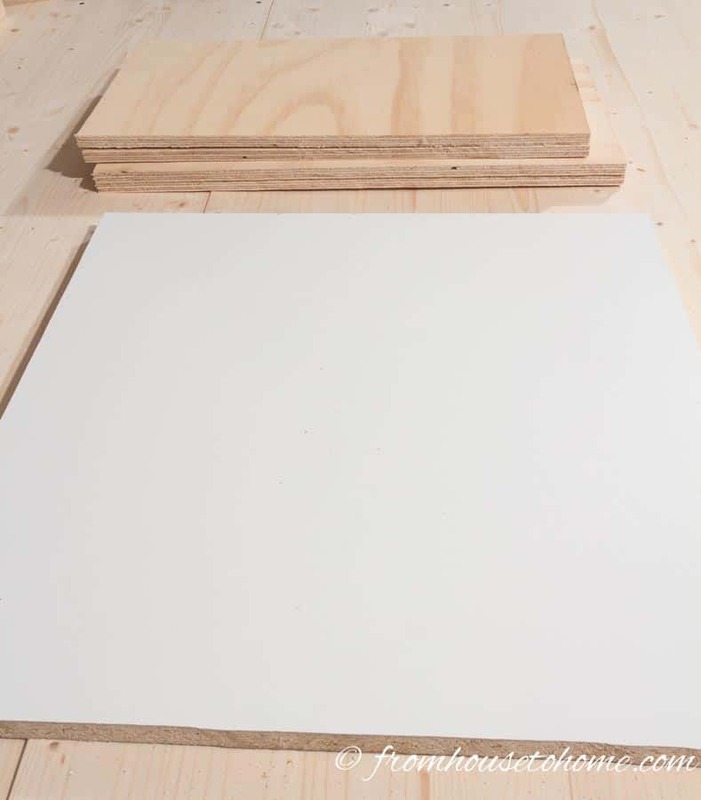 Again, you will need 4 of these boards to make 2 drawers. For all of these steps make sure that the side boards are flush to the bottom of the drawer board. 1. 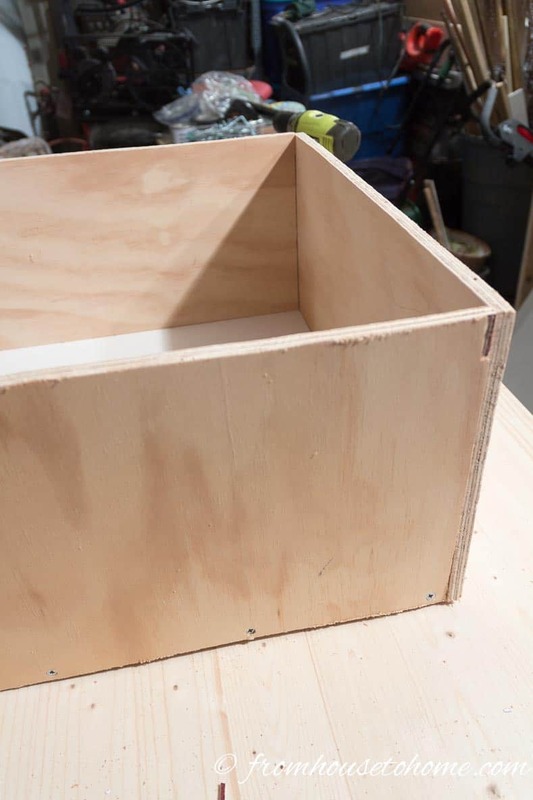 Use wood screws to attach the first end board to one end of the drawer bottom. The end boards are the ones that are the same length as the width of the drawer. 2. Use wood screws to attach the second end board to the other end of the drawer bottom…they should be on opposite sides of the drawer. 3. Use wood screws to attach the first side board to the drawer bottom. It should line up on each end with the two end boards you have already installed. 4. 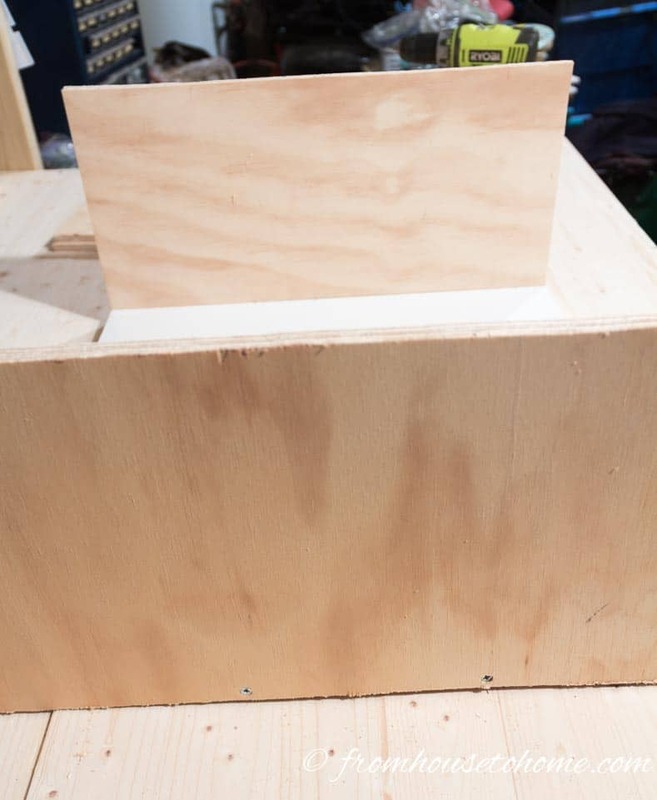 Use finishing nails to attach the drawer sides to each other so that the corners meet. Starting at the bottom and working your way up will help make sure everything is straight. 5. Use wood screws to attach the other side board to the drawer bottom. 6. 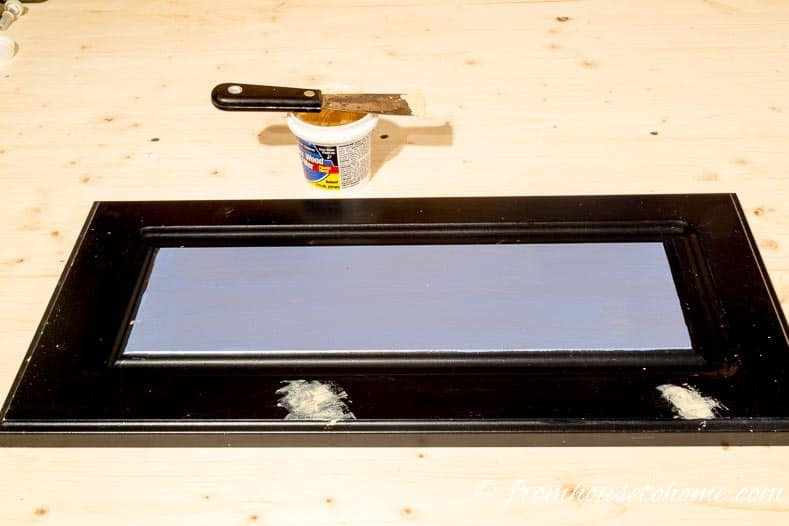 Use finishing nails to attach the sides to this end board so that the drawer is complete. 7. Repeat these steps for the next drawer. 1. Separate the drawer slides by extending them out, finding the little release latch, and pushing it down. 2. On the side of the drawer, measure up from the bottom of the drawer where you want the drawer slide to go. It should be in the lower half of the drawer but not too close to the bottom. I installed mine at 4″. 3. Draw a straight line across the side of the drawer. 4. 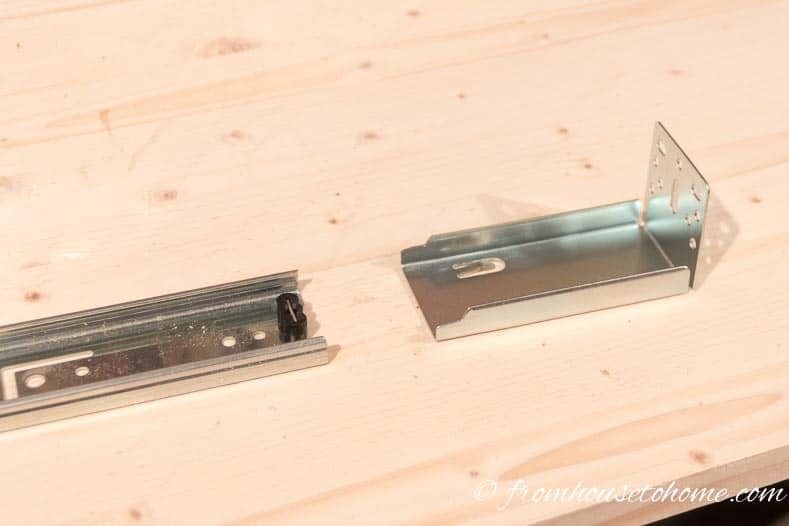 Use the provided screws to install the drawer portion of the drawer slide (this will be the part of the slide that does not extend). The bottom edge of the slide should meet your line. Make sure that you have the slide on the correct way. The closed end should be about 1/8″ from the front of the drawer. 5. Install the drawer slide on the other side of the drawer, making sure that the closed end is pointing to the same side as the first one. 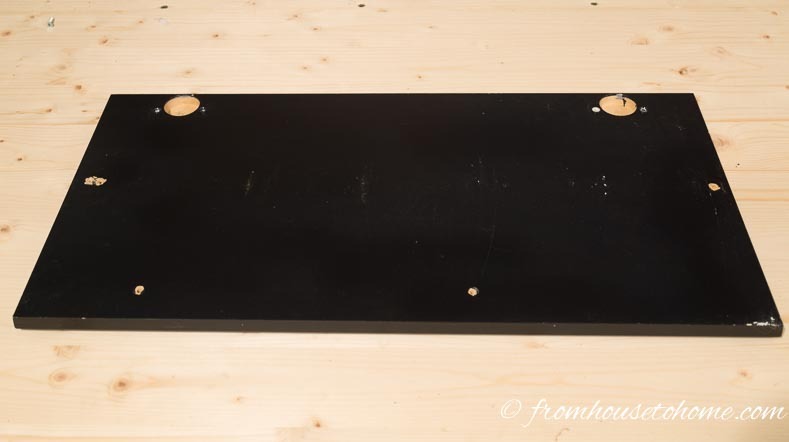 It is also important that the slide be installed at exactly the same height…otherwise your drawer will be crooked when you try to install it in the cabinet, and may not close properly. 6. Repeat these steps for the other drawer. I used heavy duty full-extension drawer slides for the drawers in my conversion. I have used these drawer slides in other applications and never had any problems with them breaking. So I decided to use them in the kitchen because I may put heavy items in these drawers. 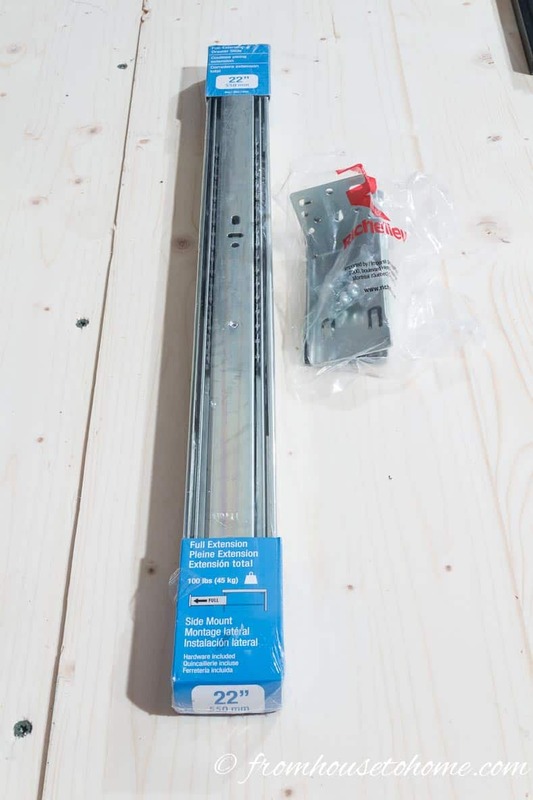 If you don’t think you need these heavy duty hinges, you can go with the standard European cabinet hinges which are a little easier to install (you don’t have to worry about matching up the slides). 1. 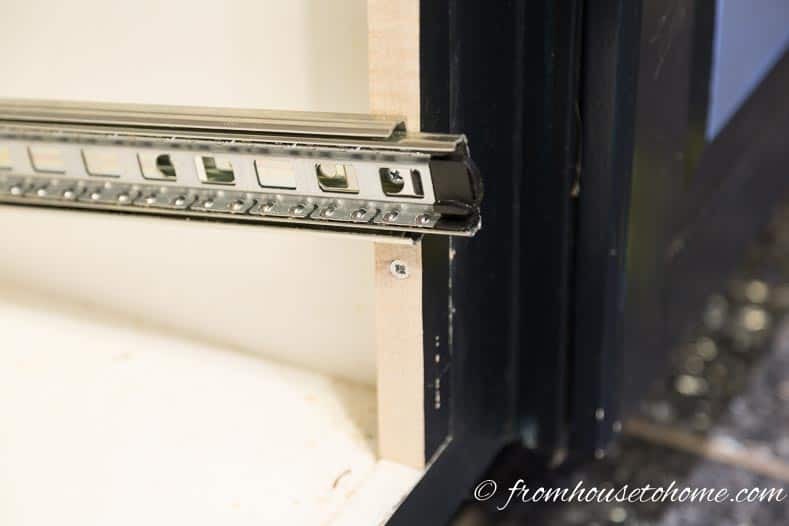 If you have face-framed cabinets like I do, you will need to add the rear mounting brackets to the end of the drawer slides. 2. Mark where the bottom slide should be installed. Measure the same distance up from the bottom of the cabinet that you did to install the drawer slides on the drawers. 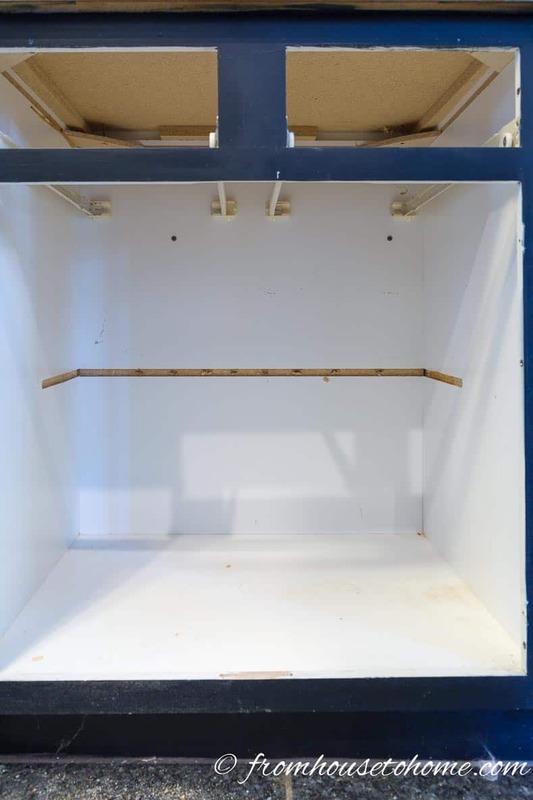 If you have face-framed cabinets where the frame sticks up a little from the bottom of the cabinet, you will want to measure from the frame up (not from the bottom of the cabinet). In my case this was 4″. 3. Mark where the top slide should be installed. 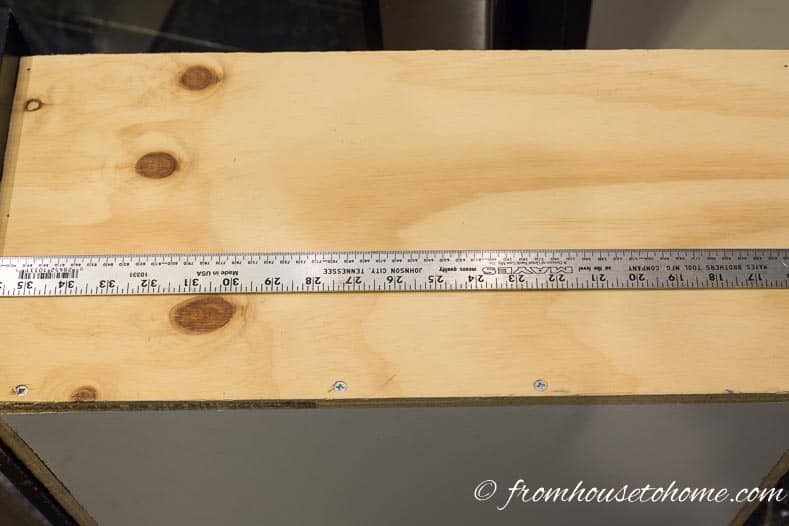 For this step, you will first need to measure the width of the cabinet doors (that are now going to be the drawer fronts). Then add ¼” clearance. This will allow the drawers to open and close without touching each other. In my case the cabinet doors were 11½” wide, so I needed to install the top drawer 11¾” above the bottom drawer. 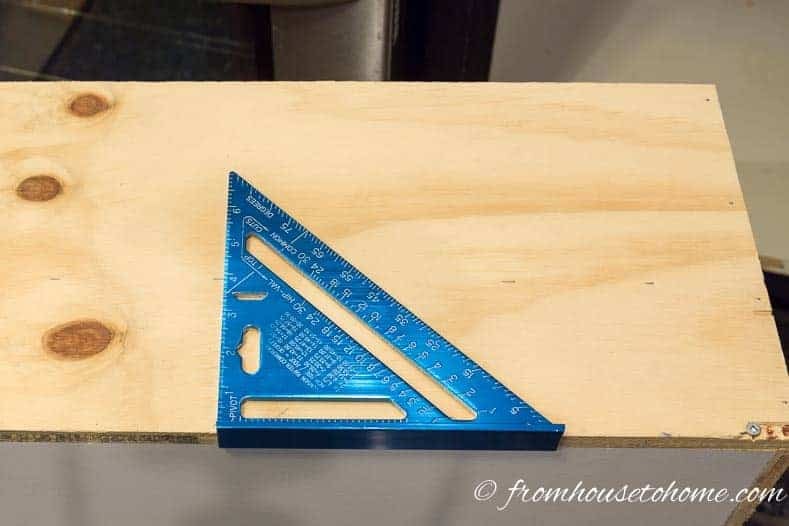 Measure this distance up from the mark you made in step 2. In my case I measured up 11¾” up from the mark I had made at 4″. 4. Install the bottom drawer first. 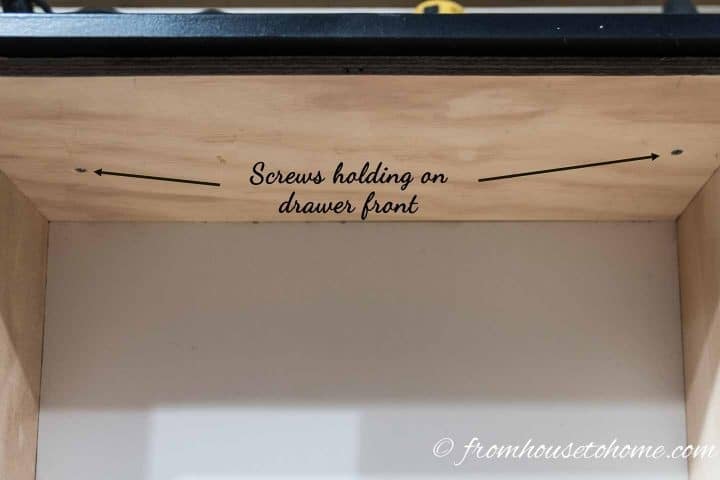 Use the provided screws to install the end of the drawer slide (that’s the part that extends) to the side of the frame at the front of the cabinet. 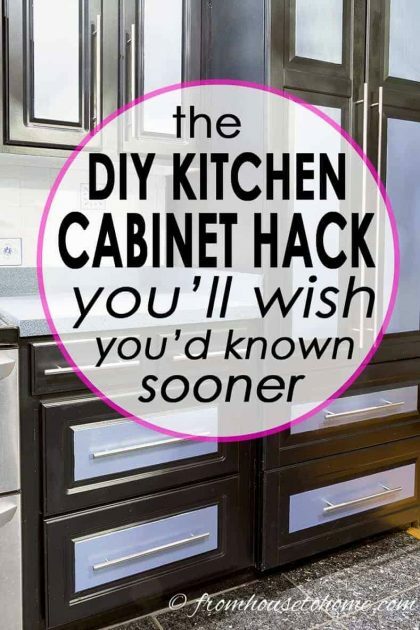 Or, if you don’t have face-framed cabinets, you can install the drawer slide directly onto the side of the cabinet. The bottom edge of the slide should meet your measurement. 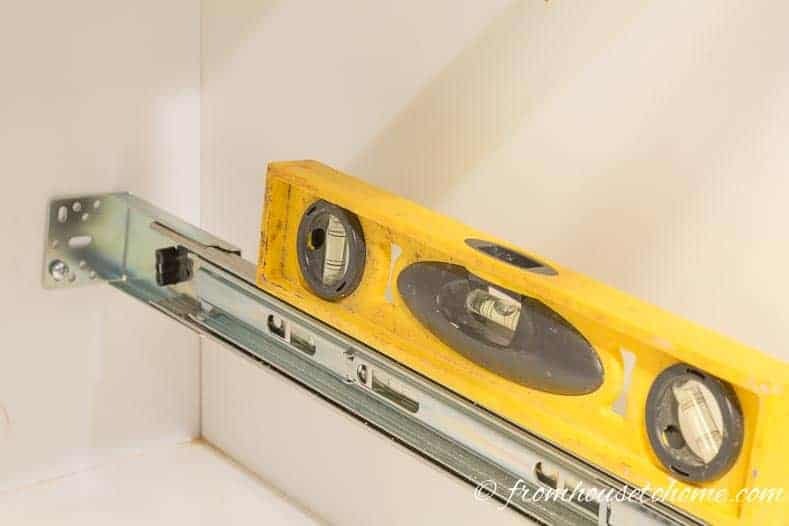 You will need to pull out the extension arm a little bit so that you can see the screw hole through one of the holes in the slide. 5. Hold up the back end of the drawer slide and make sure that it is level. Then put a screw in one of the vertical slots of the back plate to attach it to the back of the cabinet. This will allow you to make minor position changes so that the slide is level. Once it is level, put in the additional screws. 6. Repeat these steps for the drawer slide on the other side of the cabinet. Again, it is really important that the slides are installed at the same height or you will have issues with the drawer not functioning correctly. 7. Install the drawer by sliding the ends of the slide on the drawer into the slides that are attached to the cabinet. Push the drawer all the way in to make sure it has been fully locked in. 8. Repeat steps 4 – 7 to install the top drawer. 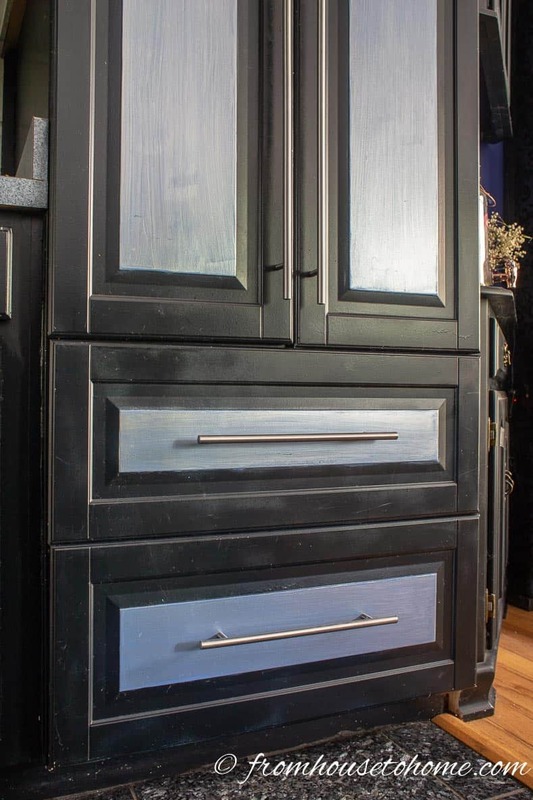 I’m assuming that professional cabinet makers would say the drawer fronts should be put on the drawers before you have them installed in the cabinet…and they probably should be. 1. Clamp the bottom drawer front to the bottom drawer so that the top of the drawer front is about ½” below the top drawer. 2. Make sure the drawer front is level and has the same amount of overhang on both sides of the drawer. 3. 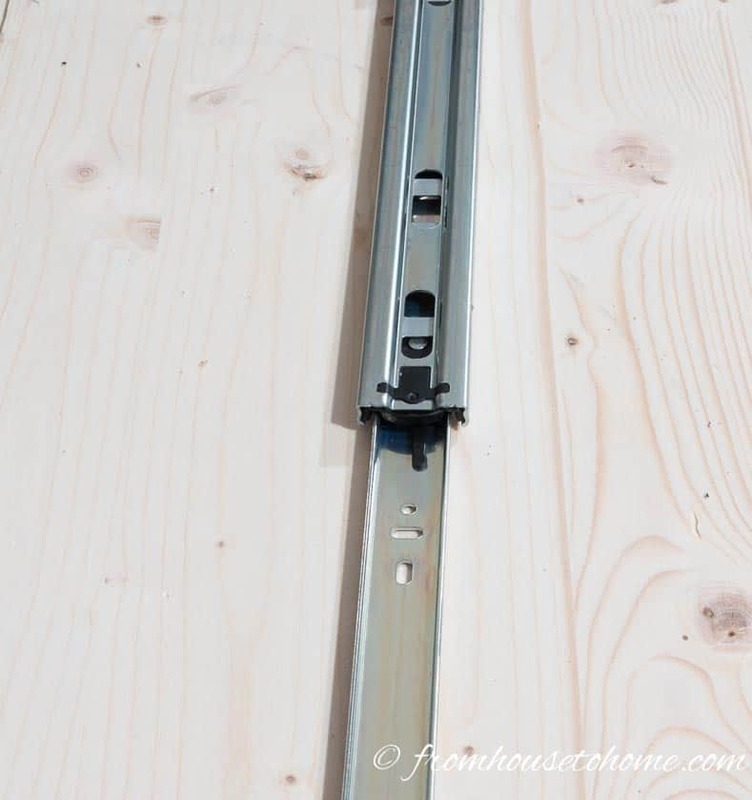 From the inside of the drawer going out, install 4 1″ screws through the drawer into the drawer front. 4. Measure where the handles for your drawer need to go. Drill holes that are big enough to fit the handle screws. Install the handle. 5. Repeat for the top drawer making sure that the top door front aligns with the bottom door front. 1. Fix up any spots on the fronts that require paint. You may need to add some caulking if you extended the frame like I did. 2. If you didn’t use melamine for the drawer, you can paint the drawers or use shelf paper to line them. Okay, so it was some work to get this cabinet conversion done, but the end result is definitely worth it! I love my new drawers! And hopefully you will love yours, too! Have comments or questions on how to convert shelves to drawers? Tell us in the section below. 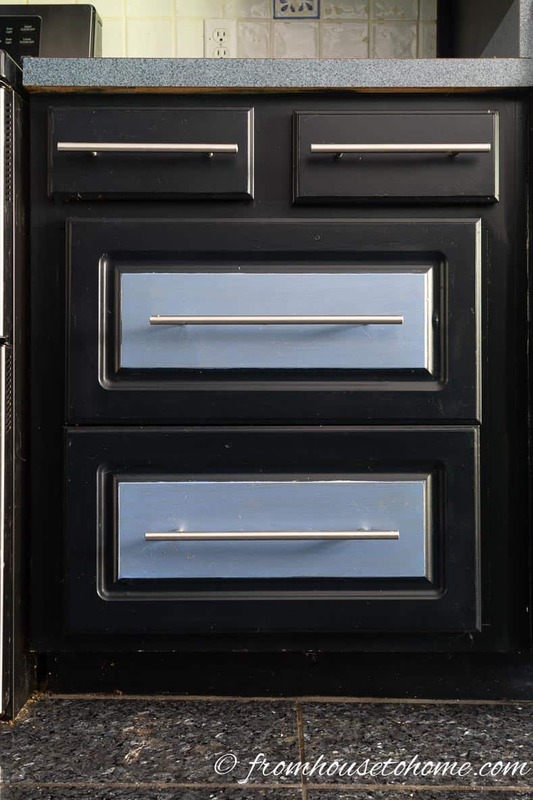 I need these drawers – my cabinets look like this but I am not smart to know how to do this _ I need someone to either do it or help me. 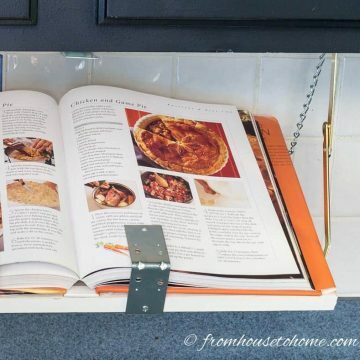 Great idea – I really want and need drawers!! Thank You!!! East to comprehend instructions! Best idea I have seen on this site! Besides the faux brick wall!! Soooooooo how does turning the cabinet into drawers help the storage problem? I would have liked to see the items organized in drawers. Thank you. Hi Vita…this project was about making the things in the cabinet easier to reach. 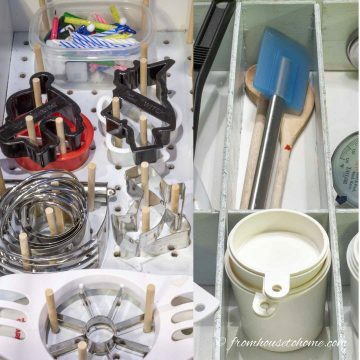 I do have another post on how to organize kitchen drawers. That may be more of what you are looking for. Very clear instructions between words and pictures!